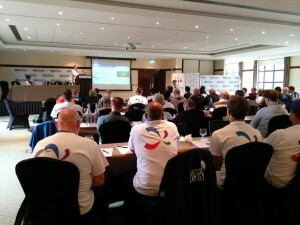 The Federation of Gay Games (FGG) held its Annual General Assembly in Limerick, Ireland from October 15 to 18, 2015. The full assembly met for three days after the FGG Board of Directors held a day of closed door meeting. 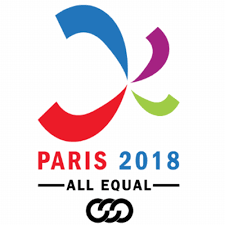 The General Assembly began with the FGG Board of Directors stating that the focus would be on Gay Games 10 – Paris 2018. More on that later. — Initial goal of participants was 11,000. — Final number was 8,000+. — Participants came from 51 countries. Less than 20% were from outside the USA. 48 out of 50 states from the USA were represented. — GG9 brought in 20,000 visitors. — GG9 brought in 225 sponsors (most of which were local). — Revenue was $6.8 million. — 36 sports were represented. — No defecit for GG9 and $147,000 were given to local LGBT foundations. — Over $52 million contribution to the local economy. — Presence in the increasingly popular Sin City Shootout did not translate to higher attendance for GG9. FGG noted that the university locations were harder to get during August and some locations did not come through. One reason was GG9 did not have strong LGBT sports groups. Cost/benefit analysis should be conducted to decide on holding some sports. FGG announced that registration for GG10 will begin in May 2016. This was followed by a legacy study presentation which did not reveal what most already know: the impact of the Gay Games and more efforts should be done to reach the underserved communities. In spite of ongoing talks with Gay and Lesbian International Sports Association (GLISA), FGG emphasized that nothing is confirmed and FGG will begin the site selection process for Gay Games 11 in January 2016. As of now, there are about a dozen cities that have expressed interest, many in the USA, including cities in Asia and Africa. Site visits will be conducted starting June next year. Priorities will be on the quality of facilities and volunteer support. The three finalists will be decided in Paris in 2017. This delegate, attending the assembly as President of San Francisco Track & Field Club, took part in the discussions of select committees. The Sports Committee reiterated that Gay Games has 29 core sports, with 19 additional sports for consideration, and host cities can add specific games. For GG10, petanque and roller derby will be added. Stating that small sports with less than 50 participants are a challenge to produce so certain sports like Flag Football, Softball and Bodybuilding may be dropped. Fencing may be added in Paris. There are some issues concerning Figure Skating, Dance Sport and Soccer that needs to be resolved. The issue with Soccer is especially contentious and much time was spent in discussing how to proceed. The discussion is still fairly open but an additional sanctioning fee may be specified and collected for certain sports. There is however, fear that other sports may ask for special sanctioning fee as well. Emy Ritt and Manuel Picaud presented the Paris 2018 report. Mark your calendars. GG10 will take place August 4 to 11, 2018. Organisers set a target of 15,000 participants: 5,000 from France, 5,000 from the rest of Europe and 5,000 from the rest of the world. There will be 36 sports, 14 cultural events (memorial, musical, visual, educational) and 1 conference before the games. Festival village will be at Hotel de Ville (City Hall) in the Marais (gay district) from 10am to 10pm. Organisers are confident of securing the proposed venues, except Tennis. That means that as of now, Track & Field is still going to be at Stade Charlety. Most red books have been validated. Organisers plan for a budget of 7 million Euros and an economic impact of more than 80 million Euros. Organisers are now gathering proposals for housing options, including dorm options and host housing. They are also of the view that August is low season in Paris and one can find accommodation with a wild price range. This delegate spoke with Emy after the presentation and agree to help in their outreach efforts to the Asian community, part of this would concern the GG10 website. The Board of Directors emphasized that no decision has been made despite of the highly contentious Memorandum of Understanding that suggest the planning of a combined One World Event from 2022 onwards. A merger of FGG and GLISA is not happening or is being discussed now. FGG is currently going through the risk assessment process to be followed by financial analysis. FGG Director of Ceremonies who is one of the key discussion representatives from FGG clarifies that in the event 1WE moves forward, his position is to have the name Gay Games 11 in this event. This discussion takes place independent from, and concurrently with the site selection process. One of the motions put forward by Wrestlers Without Borders got the assembly to debate on the merits of moving forward with 1WE. The result ended up a mandate for FGG to continue discussion with GLISA. FGG would like member organizations to add the FGG and Paris 2018 logo and link on our webpage. This delegate has also agreed to help FGG to expand their language access program. This will probably begin with translation of certain online materials. The venue for FGG AGA will be decided in December 2015.